Sign up for Broadjam today to follow Erik Bjornard, and be notified when they upload new stuff or update their news! Erik creates one or two new Holiday songs each year. This has been going on for a while, hence an Album. Erik creates one or two new Holiday songs each year. This has been going on for a while, hence an Album. 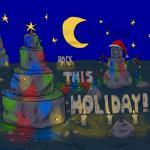 Two new songs this year: "Rock This Holiday": self-explanatory, I think, and "Let The Season (Bring it's Feast to You)": Inspired by the Holiday Feast, and the connection to our family and friends, and mostly, our Mom's cooking! May your Holiday feast evoke your Mother's best!! There isn't one. . . . Remember your Mom's best Holiday meal? This is a song about that. There's not much I really need, how about you? Inspired by a walk in the woods on a fine winter day with my Lady. the weather's nice we don't mind . . .
Then we pack it away, in the normal course of . . The Title says it all! !